As the “steward” of the time, talent, and treasure entrusted to you by generous donors and volunteers, it is incumbent on your organization to appropriately acknowledge their gifts, properly use them, and transparently manage them. Since your best prospects for future gifts are current donors, time spent in developing a more personal relationship with these donors, building their understanding of the impact they are having through their investment in your organization, and motivating them to become true champions of your organization is time well spent. Share stories/updates about the people your donor is assisting with his/her support or send articles about programs you know to be of particular interest to the donor. Thanking the donor/volunteer in a thoughtful way. Working to build a meaningful relationship. To grow a donor’s understanding and passion for your organization – and for you to understand her concerns and motivations, you have to engage with her . . . you have to spend time in genuine conversation with her. Going beyond the expected. Organizations that excel in stewardship think and act “out of the box” when it comes to attending to and acknowledging their donors. They go the extra mile past the conventional – birthday cards, holiday greetings, etc. – and surprise their donors with kind gestures like a card on the anniversary of a loved one’s death or a cheery note in the heart of a long, dark winter. Following through on commitments. Nothing can sour a donor relationship more quickly than being unreliable. A donor has to have confidence in your (personal and organizational) willingness and ability to carry through on what you say you are going to do. Being transparent and forthright about how gifts are used and managed. Donors today, more than ever, expect transparency and accountability. An annual reporting on finances and use of philanthropic resources helps to demonstrate openness and good stewardship. 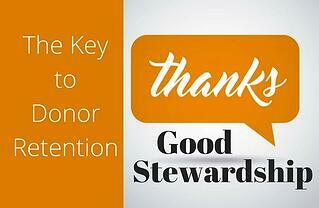 Good stewardship practices will lead to success in retaining donors and volunteers. They are not daunting or onerous tasks, but they take time, persistence, creativity, and authenticity.